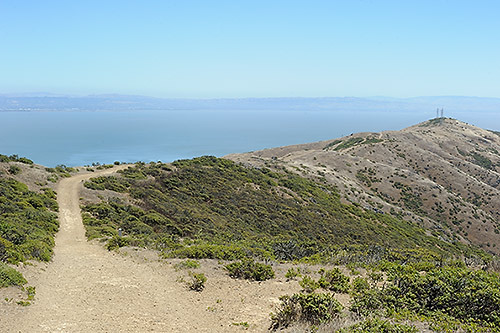 In the first chapter of the blockbuster referred to so frequently on this blog, my protagonist confides a plan for San Bruno Mountain that probably wouldn’t plump his stock at a Department of Parks meeting. I hadn’t yet visited this mountain when Hank whispered his nefarious scheme during work on the first draft, but did before I packed the final .pdf off to the printer. How grateful I am that he didn’t get his way! It’s beautiful there. I snapped these shots a few months back on the Ridge Trail, which meanders along the mountain crest for several miles from the broadcast towers off Radio Road to the junction with Harold Road in Brisbane. See how the trail clings to the very peak of the mountain? Look north, south, east or west: knock-out views. You can easily see Hank and Logos’ stomping grounds near Mount Diablo (but not in these shots; sorry). Internet wags insist that the Farallones can be glimpsed from here, too, but their eyes must be better than mine. The gentleman shown below was hiking near this fire road gate while I was sizing up a shot, and graciously let himself be drafted as an amateur model. I jotted his email, sent him a copy of the photo, and never saw him again. 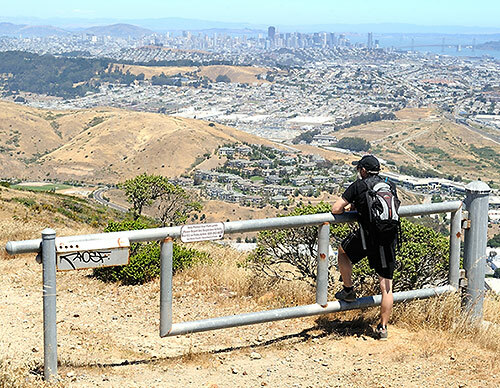 This entry was posted in Brothers of the Milky Way and tagged Ridge Trail, San Bruno Mountain. Bookmark the permalink. Post a comment or leave a trackback: Trackback URL.